Grease a 10-inch bundt cake pan or 9-inch angel tube pan. Dust with flour. Sift flour, baking powder, and salt together. In a bowl, combine butter or margarine, sugar, and eggs. Beat 3 minutes at high speed. Combine milk, lemon rind, and juice in a cup. Stir flour mix into batter alternately with milk mix, beating after each addition, until smooth. Pour into prepared pan. Bake at 350º F for 1 hour, then cool on wire rack for 10 minutes. 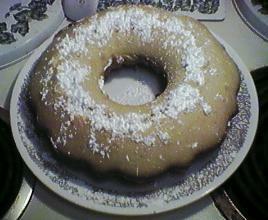 Sift confectioner's sugar on cake if desired.